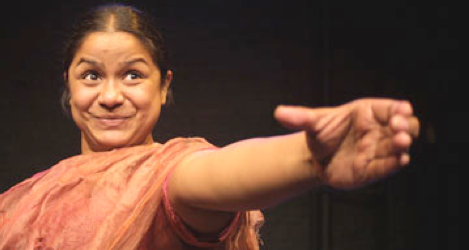 Opening Theatre Passe Muraille’s “Festival of Four Plays” is Pyaasa by Anusree Roy. Though it ran for only a week in September last year, it deservedly won Dora Awards for Outstanding New Play and Outstanding Performance. Though only 45 minutes long it is a play that gains its power through the utter simplicity of its presentation and through the outstanding performance of Roy as multiple characters. Pyaasa (meaning “thirsty” in Hindi) is a strong indictment of the caste system in India. Though discrimination on the basis of caste was outlawed in the Indian Constitution of 1950, it still remains a pervasive force in Indian society. The story of a mother and daughter who are members of the lowest caste, the “untouchables,” considered so impure as to be subhuman. As Roy demonstrates, still today there are higher caste persons who fear to have even the shadow of an untouchable fall on them since it will make them “unclean.” Roy’s story focusses on a mother, Meera, and her daughter, Chaya, whose home is a leaky plastic tent under a bridge. Meera cleans toilets and makes cow dung patties for fuel for her upper caste employer. Chaya reads any book that comes her way even though her mother warns that education will only hinder her already limited chances for marriage. Meera begs her employer to give Chaya a job at a local tea stall, but her happiness is short-lived. The brutality of Chaya’s passage from childhood to adulthood is tragic and deeply affecting. This stark tale is staged appropriately on a bare stage with a pail of water, symbolizing subsistence and cleanness, as the only prop. David DeGrow’s precise blocks of light take the place of a set. Roy’s ability to transform herself from the prematurely aged Meera to the vital young Chaya is so magical you can hardly believe both are played by the same person. Her depiction of Chaya’s ultimate loss of hope is devastating. Roy and director Thomas Morgan Jones need do no more than allow the action to speak for itself. If you missed Pyaasa last year, don’t miss it now. Note: A version of this review appeared in Eye Weekly 2008-10-27. Photo: Anusree Roy as Chaya. ©Aviva Armour-Ostroff.